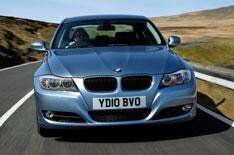 BMW 320d Efficient Dynamics driven | What Car? A funny thing has happened to BMW in recent years. It no longer talks about 'ultimate driving machines' (well, not often, anyway), and references to 'unbeatable BMWs' are more likely to refer to fuel economy and company car tax scales than dynamic prowess. Emotion has been overtaken by cold logic. Its a company that has come over all sensible. They don't come much more sensible than this the 320d Efficient Dynamics. In effect, it's a business-user special version of the 3 Series saloon, created at the behest of the UK market, which will take 60% of production. Fuel economy: 68.9mpg. CO2 emissions: 109g/km. Company car tax band: 13%. All of which means businesses can write off 100% of the cost of the car in its first year, and can probably expect higher resale values when the time comes to sell it on. You might expect figures like that from a supermini or maybe a compact hatch, but this is a junior executive saloon. Incredible. To make it possible, there's a new version of BMW's 2.0-litre turbodiesel engine. It develops 161bhp, which is 20bhp less than the regular 320d, but has the same amount of torque (280lb ft), and employs various tricks to reduce frictional and heat losses. Super-long gearing means the engine is turning over at less than 2000rpm at the UK motorway limit, and therefore using less fuel. There are also the usual 3 series economy aids of engine stop-start, brake energy recovery and a gearshift indicator. So where's the catch? Frankly, there isn't one. The car costs exactly the same as a regular 320d, and its 20bhp power deficit is ably compensated for by the plentiful torque, which kicks in at just over 1500rpm and is on full stream by 1900. You don't have to be forever stirring the gearlever, therefore, and any notion that the super-long sixth gear will only be usable on an empty flat motorway at 4am can soon be dispelled. You'll be surprised how often you can make use of it. There's a bit of rattle and rumble from the engine after a cold start or when accelerating sharply, but for the rest of the time the extra measures BMW has introduced to ensure it stays quiet and refined at its lower operating range work well. You're mostly unaware it's there at all. If someone had suggested all this was possible just five years ago, you'd have called them bonkers.